Be Prepared Not Scared is an emergency preparedness challenge from Alberta. It has two mandatory sections (Learn and Do) and a third optional section (Safe Guide). This challenge is less structured then the Emergency Preparedness Challenge from Ontario. While looking for information on the challenge I came across a similarly title booklet from the Red Cross and Federal Government that would provide a useful resource for the challenge: Be Prepared Not Scared: Emergency Preparedness Starts with You. And I also found this similarly useful resource from Alberta Health Services: Personal and Family Disaster Preparedness Guide. The last two meetings we’ve been working on the First Aid Badge along with the first aid sections of Learn About Safety. The first week we had a guest speaker come to the meeting. We alternated teaching time with the girls breaking into groups and trying things out. The speaker covered all the basics of emergency scene management. She talked to the girls about the recovery position, getting help in a timely way and choking. The second week we held a round robin of first aid skills. A station about burns, sunburns, hypothermia and frostbit where they played a variation on Becky’s (Dragon’s) red light, green light first aid game. At the final station they made mini-first aid kits, like the ones made in film-canisters, only we used pill bottles donated by local pharmacies. The Great British Columbia Shakeout is a annual earthquake drill held in British Columbia, Oregon and California. The BC Shakeout Challenge is a challenge designed to prepare girls in British Columbia for a major earthquake. 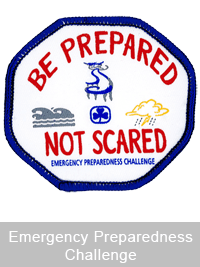 The Emergency Preparedness Challenge is a challenge for Guides presented over 3 weeks of meeting plans. It might make a nice accompaniment to the First Aid badge or if you are covering sections of Learn About Safety.